After reading and being deeply engrossed in The Namesake and Pulitzer Prize winning novel Interpreter of Maladies, I was eager to learn more about the author in her new autobiography, In Other Words. Lahiri’s fiction is fluid, honest and highly insightful, so I was intrigued to read her first work of non-fiction. The themes in the two novels had similarities; the notion of being an outsider, how to assimilate into a culture that is not your own and yet retain that cultural identity with that Motherland and familial relationships. Indeed, if you have read any of Lahiri’s other work, you will observe these common themes, and they are central in this new non-fiction work, with the exception that this time instead of creating the characters to play the parts, she is the character. London born and transplanted to America with her Bengali parents, she always teetered on the cusp of cultures. Not quite Bengali, because of the American and not quite American because of the Bengali, Lahiri decides to choose a country where she is a complete exile-Italy. Though she had taken Italian lessons at school, enlisted private tutors and studied meticulously, she felt that her language acquisition had become compartmentalized so that it was not applicable or used in everyday life. Six months before she heads to Rome, where she does not know a soul, she decides to give up English altogether to read, write and think only in Italian. Language is power. Language is identity. Language dictates worldviews, customs, mores and social norms. “To know a new language (or indeed any new endeavor,) to immerse yourself, you have to leave the shore. Without a vest. Without depending on solid ground”. To get lost in another language is essentially, to get lost in another world and that is precisely what Lahiri is looking for. For it is in getting lost that she finds herself. 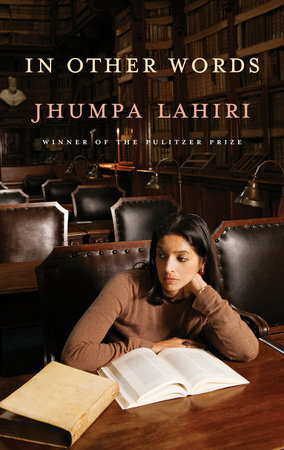 Look for Jhumpa Lahiri’s other great titles in our catalog- The Interpreter of Maladies, The Namesake, The Lowland, and Unaccustomed Earth. You will not be disappointed!